Let the SONOS hacking begin! I always wanted a networked multi-room audio solution as you can easily see here and here and here and here. Now it seems I’ve finally found something that integrates very well into our music listening habits and our infrastructure. And on top of that it turned out to be highly hackable. 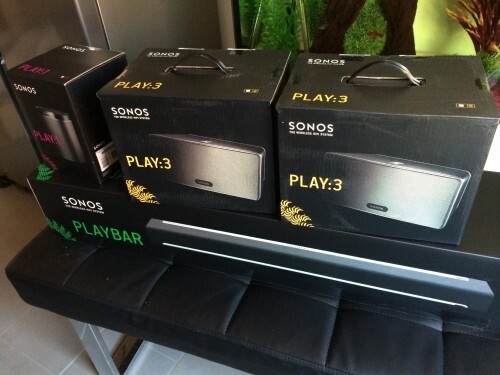 I’ve went with SONOS for that multi-room solution. After trying two speakers for two rooms I’ve invested the budget into the full-house solution (not all speakers on below picture). And finally everything is as I always wanted. Be warned: If you buy one speaker, you will definitly buy more. So what’s in those boxes? Besides beautiful and high-quality speakers there’s a 250 Mhz linux powered computer inside each speaker. It got 64Mbytes of memory and wireless adapters to span it’s own wireless mesh network (hidden by default). Each speaker on it’s own can be controlled and accessed through the SONOS controller applications (Windows/Mac/iOS/Android) or through several tools that open up new possibilities. There will be more articles coming on the topic of hacking SONOS, adding functionality and using it for things not officially planned for by the manufacturer. Joy!